Ocean City, Maryland is a popular tourist destination on Maryland's Eastern Shore. Ocean City is located 90 minutes East of Talbot County, Maryland on Rt. 50. But did you know Talbot County has sandy beaches, too? The beaches of Talbot County are a lot smaller then you would expect to find at Ocean City, Maryland. But if you are a beach lover, you can save yourself 90 minutes from driving to Ocean City, and stop off in Talbot County. Oxford, Maryland has the best beaches in Talbot County. Check out the public beach in Oxford when you turn right before the Oxford ferry dock and drive down East Strand Road. The small sandy beach on your left has a marvelous view of the Tred Avon River. You are in walking distance to Schooner's Landing Restaurant and the Scottish Highland Creamery's freshly made ice cream. For some shade take a break at the Oxford's Waterfront Park where you can have a picnic and walk down to a beach area. The Oxford Market has picnic supplies as well as ice cream. 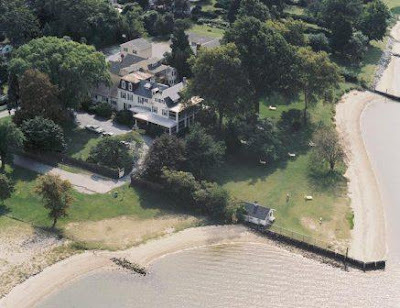 If you want to stay on a beach, Sandaway Waterfront Lodging Bed and Breakfast has a large waterfront lawn with a private sandy beach for guests to enjoy. You have to book a room at Sandaway to use the beach, but it is money well spent if you need a break from the kids or crowds of tourist you would find at Ocean City, Maryland.